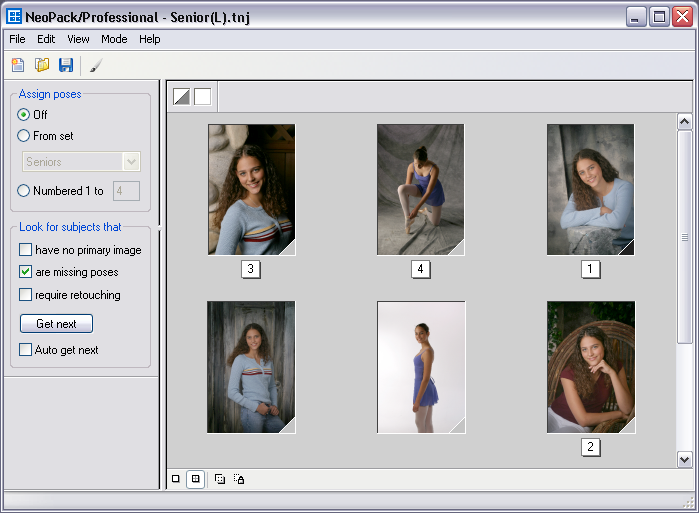 If a text file has pose numbers or pose labels assigned to each inage it is possible to import these pose numbers. The concept is perhaps best explained by way of example. Consider a high school seniors shoot. Each student has a had a number of photographs taken but only the best four have been assigned poses, Taking one particular student as an example, Loretta Fusel, the text file might look something like this. Four images have been assigned a pose number and the text file now looks like. Once the import is complete check the import in Poses Mode.